Happy holidays! I hope the close of 2018 is filled with many celebrations, but also quiet time to thoroughly enjoy and reflect upon the season. My final recipe of 2018 follows my interest in Korean food that was sparked earlier this year. Since then, I’ve made many traditional Korean recipes at home, and I’ve also played with popular Korean ingredients to make my own dishes. 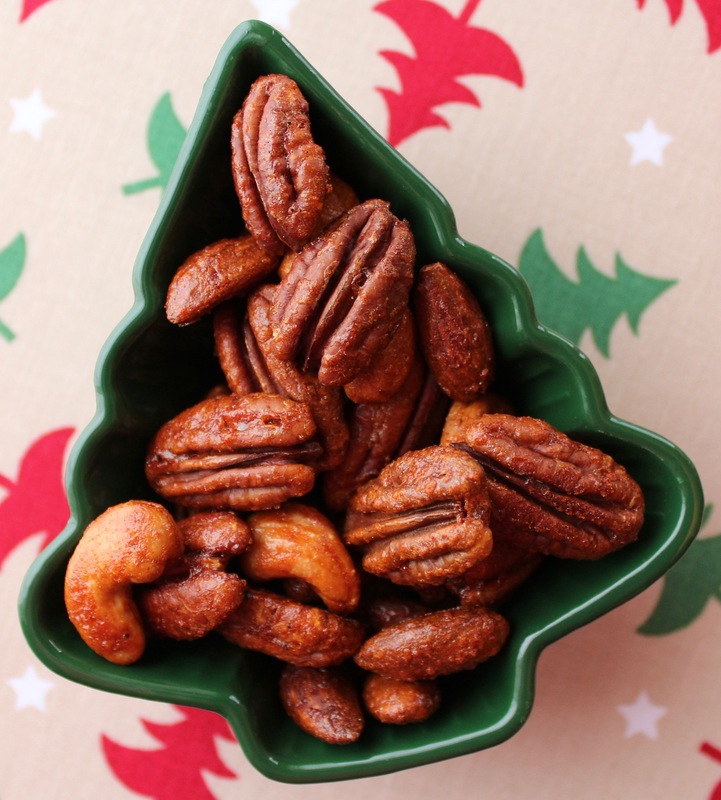 This is a twist on the classic holiday party snack of sweet and spicy mixed nuts, but I used gochujang to add a delicious depth of flavor. Preheat oven to 325 F. Line a half sheet pan with parchment paper. In a small saucepan, heat the sugar, gochujang, water, and sea salt until the sugar has dissolved. Remove from heat. In a medium bowl, toss the nuts with the sugar mixture until evenly coated. Spread the mixture evenly onto the prepared sheet pan. Bake for about 15 minutes, or until fragrant. Let cool completely. Serve immediately or store in an airtight container for later snacking. Remember the paper snowflakes you used to make as a kid? Fold up a piece of paper and cut slits into it. When you open it up again, you end up with a beautiful snowflake! That is the general idea behind these crackers. Let your inner child come out to play this winter with this fun little baking project. 🙂 Bonus: It will warm up your kitchen! Fold each wonton wrapper in half, and then in half again. With a sharp pair of kitchen scissors, cut little slits into the sides of the wrapper. Open the wrapper so it lays flat again. Spray the wrapper with a light coating of cooking spray and gently rub the oil evenly over the surface with your finger. Season with a sprinkling of salt and Parmesan if you would like. Repeat with as many crackers as you desire. Bake for about 7 to 10 minutes, or until the wonton wrappers are golden brown and crunchy. Preheat your oven to 350 F. Line 2 baking sheets with parchment paper. In the bowl of a stand mixer fitted with a paddle attachment, beat the sugars and the oil or butter, whichever you are using, until well combined. Add the egg and vanilla, and beat until well incorporated. Add the flour, baking soda, and salt, and beat until just combined. Add the nuts and the chocolate. Mix them into the dough by hand with a spatula. For each cookie, scoop out 1 tablespoon of dough and roll between your hands to form a dough ball. Place the balls on the prepared baking sheets, pressing down slightly to make them discs. Make sure to give them about an inch and a half to spread while baking. Bake for about 12 minutes, or until cooked through, rotating the pans halfway through to ensure even baking. 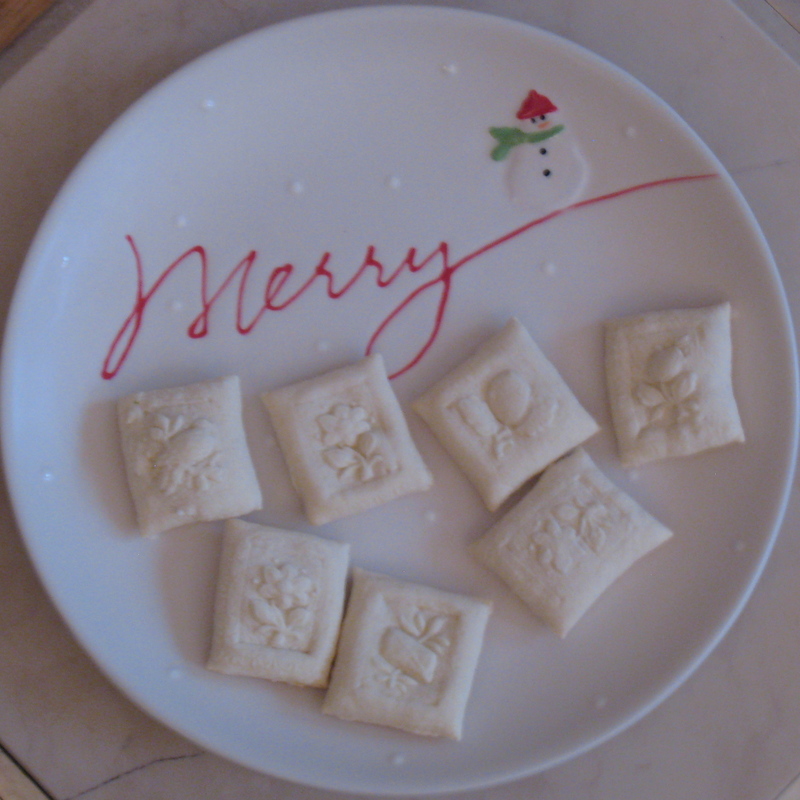 I couldn’t resist making one more batch of Christmas cookies before the holiday. 🙂 I altered my sugar cookie recipe to make them eggnog sugar cookies! I added a good amount of nutmeg to the batter, and replaced a little of the butter in the original recipe with eggnog. Then I made a simple eggnog glaze as the finishing touch. Merry Christmas from my kitchen to yours! In a large bowl, whisk together the flour, nutmeg, and salt. In the bowl of a stand mixer fitted with a paddle attachment, cream the butter and sugar until light and fluffy. Beat in the eggs, one at a time. Add the eggnog and vanilla, and continue beating until all of the wet ingredients are well combined. Add the flour mixture, and beat until just combined. Wrap the dough in plastic wrap and refrigerate for at least an hour. Prepare two baking sheets with parchment paper. On a floured work surface, roll the dough until it is slightly thicker than 1/8 inch. 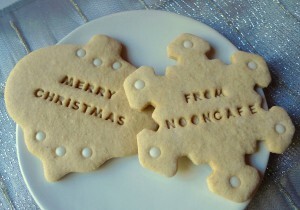 Cut into desired shapes with a cookie cutter. Place the cookies on the prepared baking sheets. Bake for about 7 minutes, or until slightly firm in the middle, rotating the pan halfway through. Cool the cookies completely on a wire rack. Whisk the sugar and eggnog together until the mixture is completely smooth. Either spread or pipe the glaze onto your cookies. Move your oven rack so that it is about 1/3 of the way down from the top. Preheat to 400 F. Line two sheet pans with parchment paper. In a medium bowl, whisk together the flour, cocoa powder, cream of tartar, baking soda, salt, nutmeg, cayenne, and 1/2 teaspoon of cinnamon. In the bowl of a stand mixer fitted with a paddle attachment, beat the butter and 1/2 cup of sugar until light and fluffy. Add the vanilla, milk, and egg. Beat until well combined. The mixture will look a bit broken when you start mixing at this point, but just keep at it, and it will come together. Add the dry ingredients and mix until just combined. The dough will be rather sticky. In a shallow bowl, add the remaining sugar (1/4 cup) and cinnamon (1 teaspoon.) Whisk until combined. Using a tablespoon, scoop out balls of dough. Roll the balls between your hands. Drop them into the sugar and cinnamon mixture and coat well. Place the dough balls on your prepared baking sheet. Repeat the process until you use all of the dough. Make sure the cookies have a couple of inches to spread on the sheet. Bake for about 10 minutes, or until the cookies are set and a bit cracked on top. 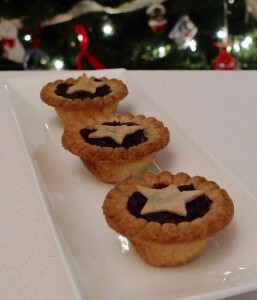 These sweet little star-topped mince pies were the grand finale of my Christmas dinner this year. 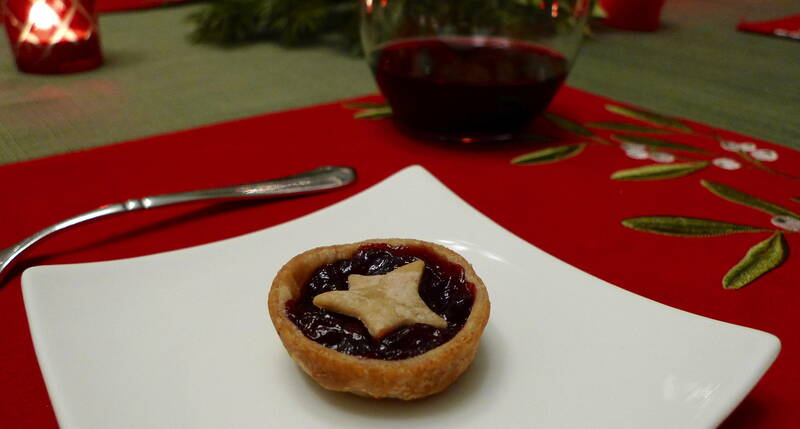 They were the perfect finish, and just the right size after a beef Wellington feast. In a medium saucepan over medium heat, add the port, apple, fresh (or frozen) cranberries, and spices. Cook until the cranberries begin to bubble and pop. Then add the currants, raisins, dried cranberries, and the orange zest and juice. Bring the mixture to a simmer. Cook for about 20 minutes, until the fruit has absorbed most of the liquid. If you still have many whole cranberries, you can squish them with your spoon to help them incorporate into the mixture. Remove the pan from the heat. Then add the brandy, extracts, and honey. 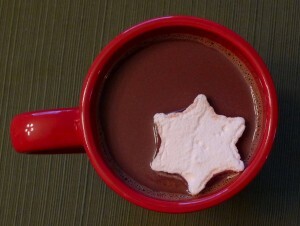 Stir until everything is well incorporated. With a food processor, pulse the flour, salt, and butter until the butter is the size of small peas. Gradually add the water until the mixture comes together. Add only enough water to combine everything. You may not need a full 5 tablespoons. Form the dough into a disc, and wrap in plastic wrap. Refrigerate at least 15 minutes before rolling it out. It also freezes well. Just take it out of the freezer and refrigerate the night before you will need it. To assemble, grease a mini muffin pan very well, and set aside. On a floured surface, roll out the pastry into a very thin sheet. 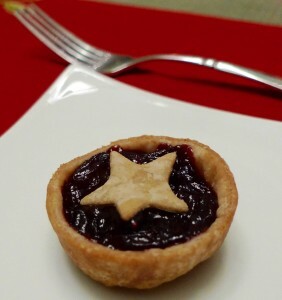 Cut out circles for the crust and stars for the top. Carefully fill the muffin pan with the crusts, fill each crust with the cooled mincemeat, and top with a pastry star. Bake for about 10 minutes, or until the pastry is golden, and the bottom crusts are baked through. Let cool before serving. 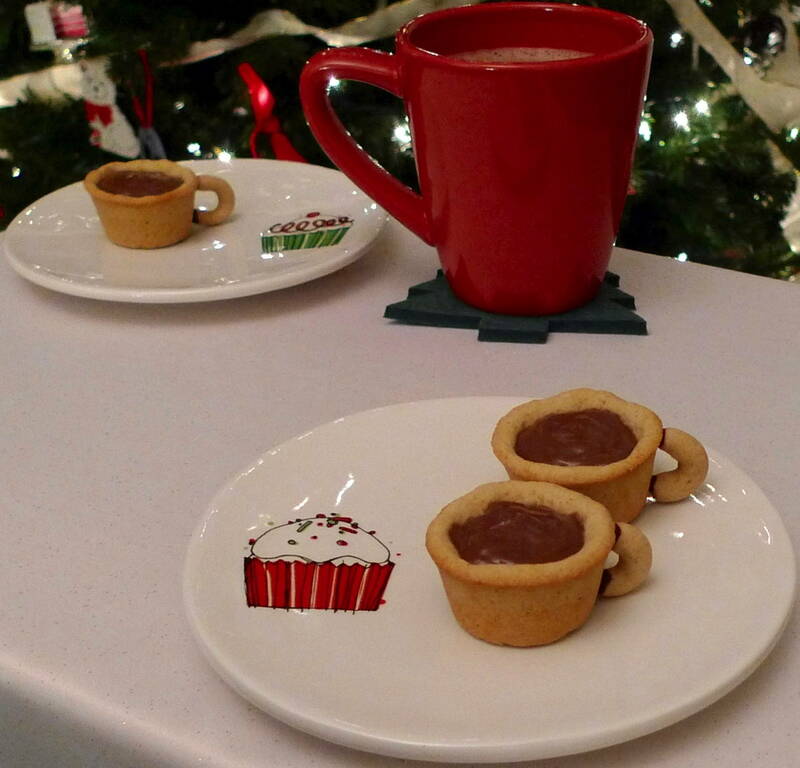 These festive little cookie cups will make a perfect dessert for your Christmas meal. I think Santa might like them too! 😉 I made a simple whole-wheat sugar cookie dough for the cups and handles. 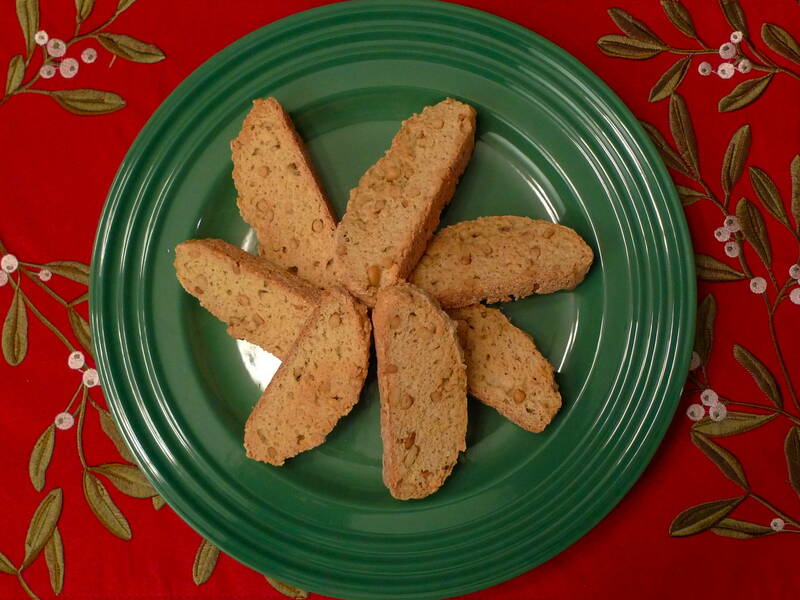 They have a lot less sugar and butter than many recipes to keep them a little lighter. 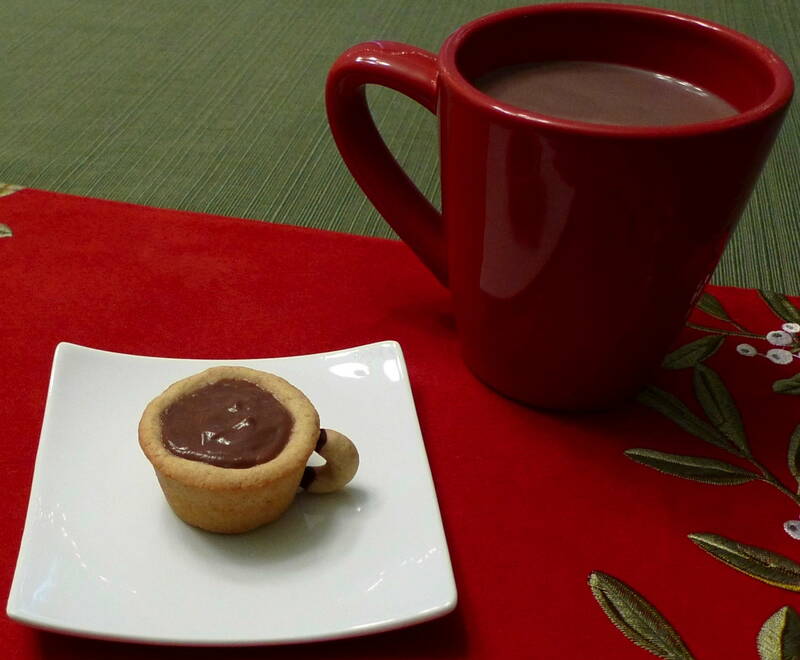 Then I filled the cute little cups with my favorite chocolate mint pudding that is a regular at our house. In a large bowl, whisk together the flour and salt. In a second large bowl, beat the butter and sugar with an electric mixer until light and fluffy. Add the vanilla. Beat in the eggs, one at a time. Add the flour mixture, and beat until just combined. You may need to hand mix the last bit if the dough becomes too thick for the mixer. Wrap the dough in plastic wrap and refrigerate for at least an hour. Prepare a mini muffin pan by greasing it very well. Prepare a baking sheet with parchment paper. Reserve about 1/4 cup of the dough for the cup handles. With the remaining dough, roll approximately 1-inch balls between your hands, and place them in the prepared muffin tin. Push the center of each ball until it squishes up the side of each hole. Make sure to press the sides and bottom firmly so there are no gaps in between the dough and the pan, and make sure the top is neat. The sides and top will be visible in the final product. With the reserved dough, roll small pieces into thin lines, and fashion them into tiny cup handles. Place the handles on the prepared baking sheet. Bake the cups for about 15 minutes, or until firm, rotating the pan halfway though. Let cool for a couple of minutes before removing the cookies from the pan. Bake the handles for about 7 minutes, or until firm, rotating the pan halfway through. Cool the cups and handles completely on a wire rack. Over a double boiler, melt the chocolate. 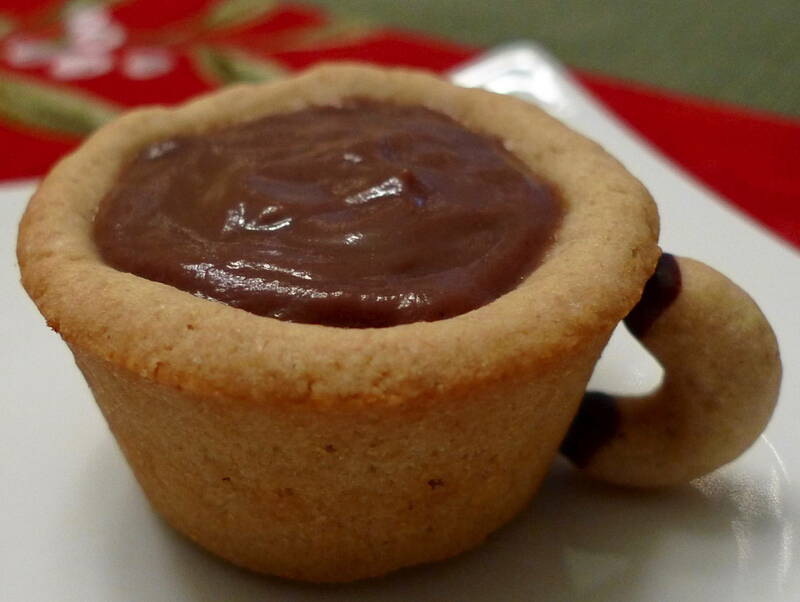 Place all of your cups on their sides in the cleaned mini muffin pan to prop them up. The side of each cup should be facing up. Dip the edges of the cup handles in the chocolate, and gently place on the side of the cups. Let stand to dry for at least an hour. Begin by placing a fine mesh strainer over a medium bowl. Set aside. 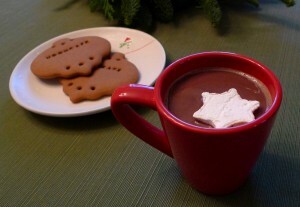 Off the heat, in a medium saucepan, whisk the sugar, cornstarch, salt, and cocoa powder. Turn the heat onto medium high. Gradually add the milk, whisking well to dissolve the cornstarch. Add the egg yolks, and whisk until incorporated. Continue to whisk occasionally, until big bubbles begin to form. At that point, reduce the heat to low. Cook one more minute, whisking constantly. The consistency should be creamy and thick. Remove the pudding from the heat and pour it through the strainer into the bowl. Add the vanilla and mint to the hot pudding, and whisk until well incorporated. Cover the pudding directly on the surface with plastic wrap. Refrigerate for at least three hours. Before serving, whisk it one more time to make sure the consistency is smooth. 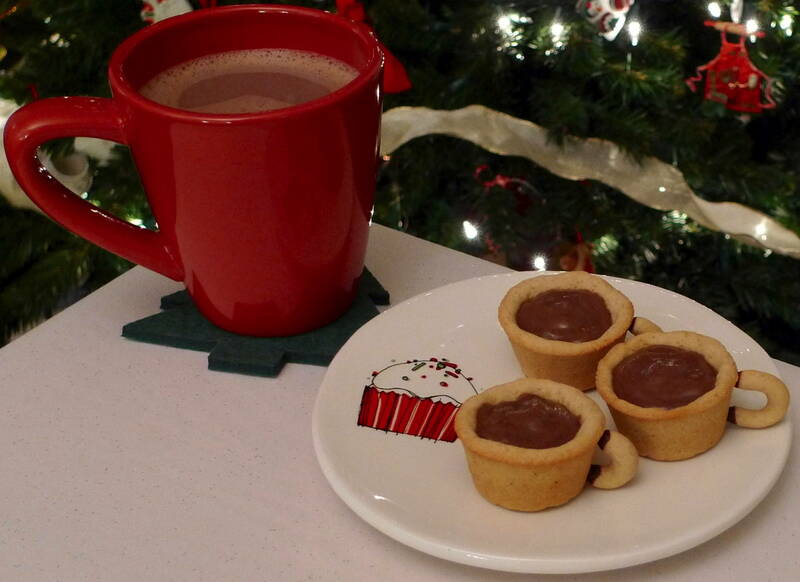 Place the pudding into a piping bag to neatly fill the hot cocoa cups. Use the back of a small spoon to smooth the top. 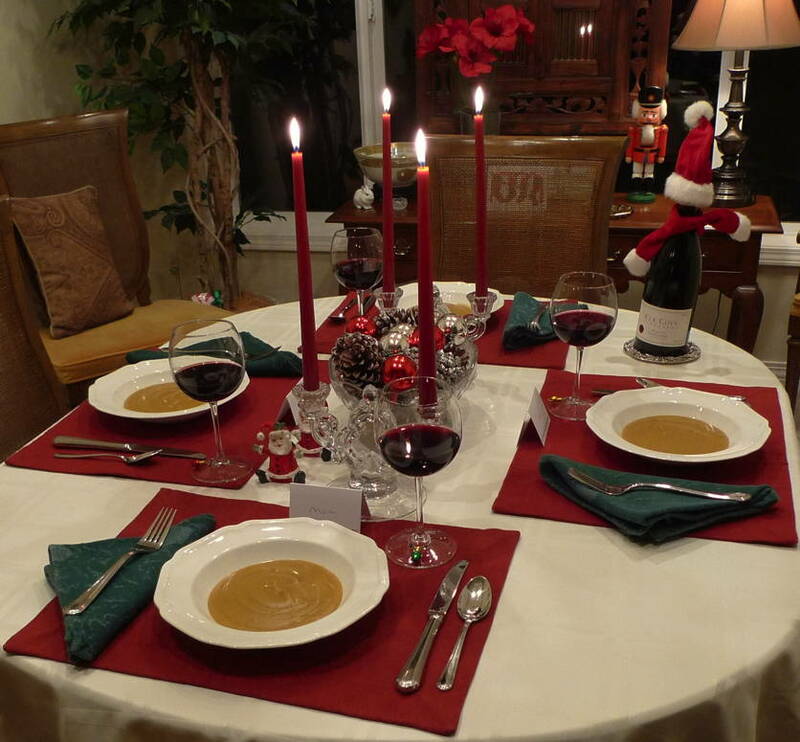 Instead of roasting chestnuts over on an open fire, I made a festive and creamy chestnut soup with truffle oil for Christmas this year. 🙂 It was a unique and delicious first course to our family dinner! 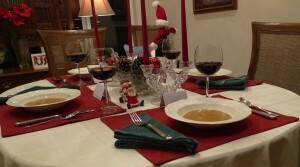 The original recipe was from a cooking class at Sur La Table. I omitted the 1/2 cup of heavy cream altogether since it was luscious and creamy without any dairy, and I replaced the butter with Earth Balance. I also added a little more chicken broth than the original recipe called for to make the soup a little thinner. Place a large, heavy saucepan on the stove over medium heat. Heat the Earth Balance and oil until melted. Stir in the onion, carrots and celery and cook until tender, about 7 minutes. Stir in the garlic and cook until fragrant, about 1 minute. Stir in the chestnuts and salt and cook until the chestnuts are coated in the aromatics and warmed through, about 4 minutes. Increase the heat to medium-high, add the sherry and thyme and cook until the liquid has evaporated. Add the stock and bring to a boil. Reduce the heat to a simmer, cover and cook until the chestnuts are tender, about 30 minutes. Discard the thyme sprigs. 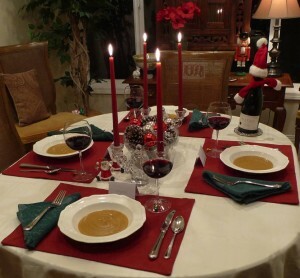 Using an immersion blender or standard blender, puree soup until smooth. 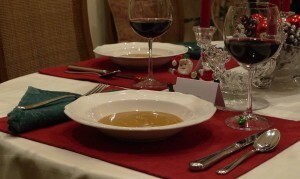 Return the saucepan to the heat, add more broth if you would like the soup to be thinner, and bring back to a simmer. Taste and adjust seasoning with salt and pepper. To serve: Using a ladle, transfer the soup to individual bowls. Drizzle with truffle oil and serve immediately. on a candy thermometer, about 20 minutes. Remove from heat, and stir in vanilla, salt, and spices. Immediately pour onto prepared sheet, without scraping pot. Let stand, uncovered, 24 hours at room temperature (do not move pan). Generously coat a large cutting board with cooking spray. Lifting it by the parchment overhang, invert caramel onto the cutting board; use a sharp knife to loosen parchment, and remove. 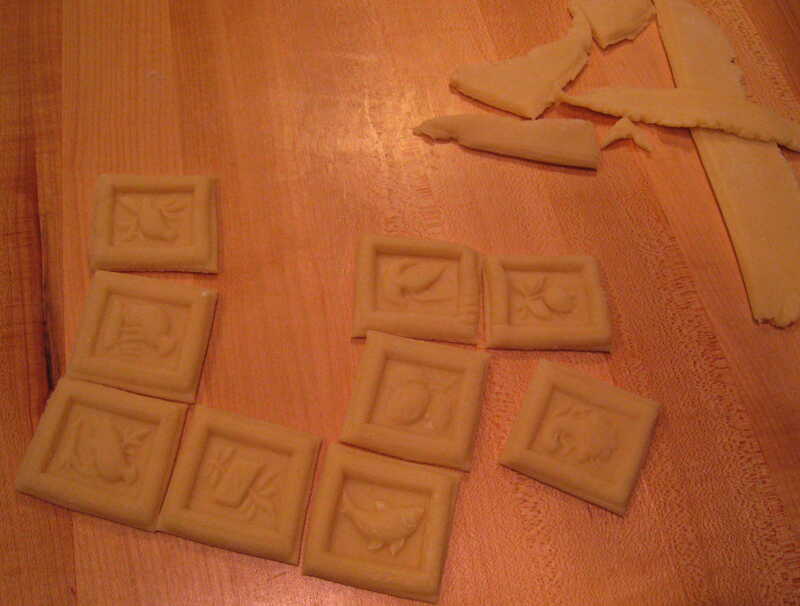 Cut into 1-by-1 1/4-inch pieces. 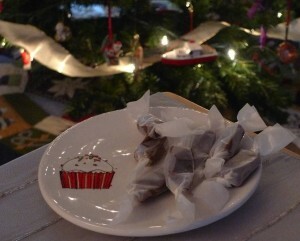 Wrap each in cellophane or waxed paper. Caramels can be stored up to 1 month in airtight containers. 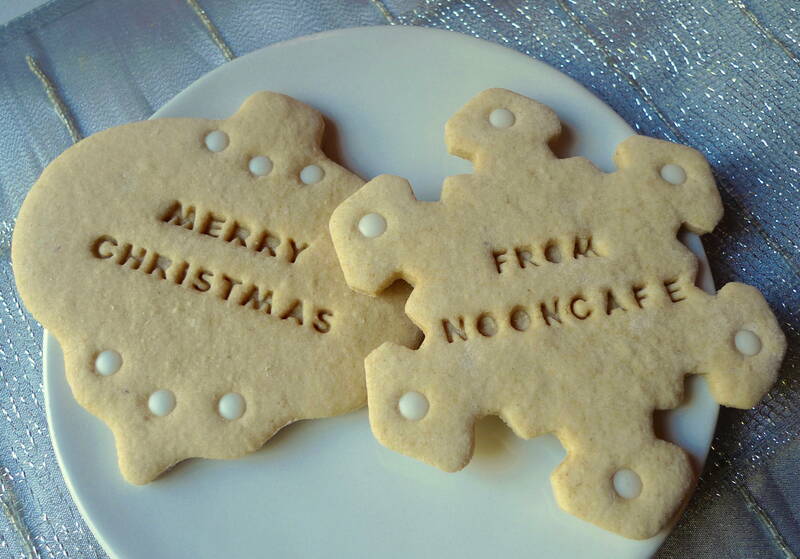 Merry Christmas from Noon Cafe! 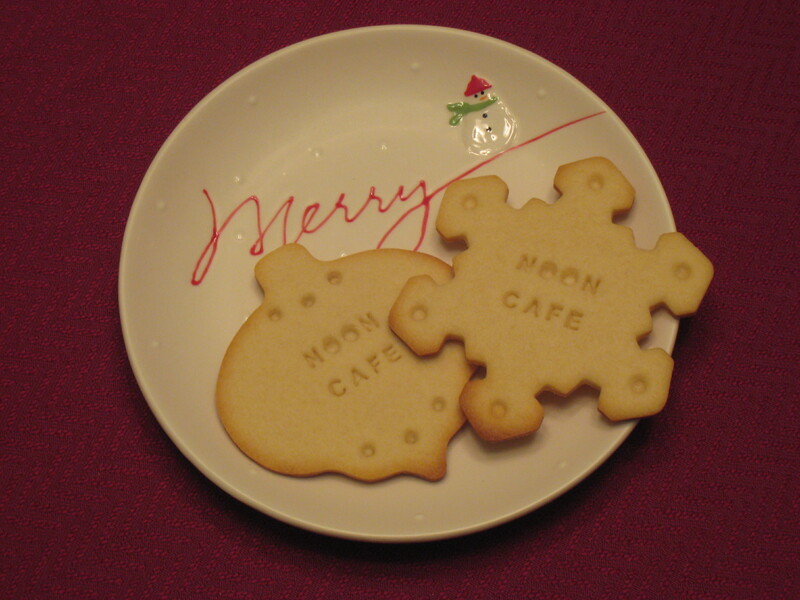 http://nooncafe.com/wp-content/uploads/2015/07/NoonCafe-Logo-with-full-shadow.21.png 0 0 Laura http://nooncafe.com/wp-content/uploads/2015/07/NoonCafe-Logo-with-full-shadow.21.png Laura2013-12-24 10:01:252015-07-16 11:10:59Merry Christmas from Noon Cafe! 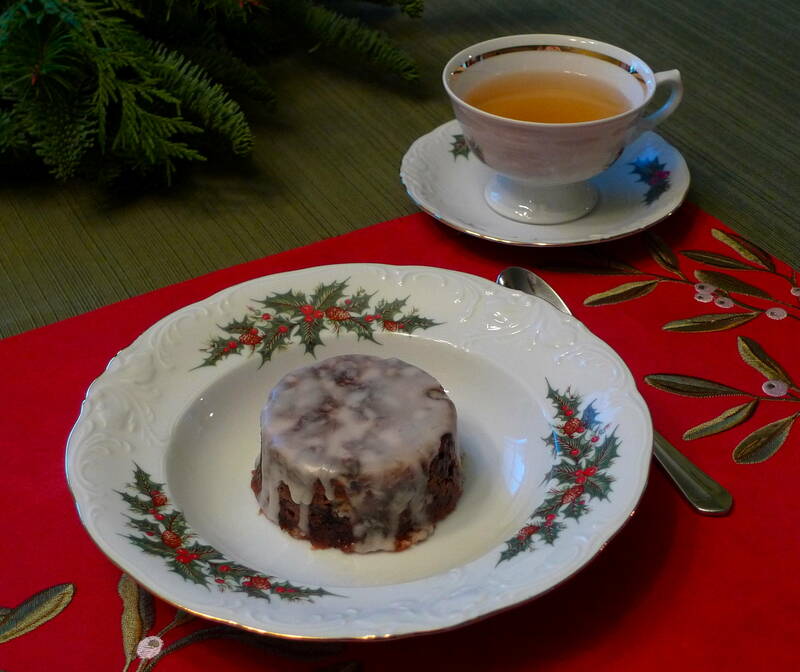 I decided to explore my British heritage a little this December by making Christmas pudding. It is also called plum pudding, but the interesting thing I learned is that there are no plums in the dish. The pre-Victorian use of the word “plum” meant “raisins,” and it does have plenty of those! I love the tradition of making a wish as you stir the pudding. It is also traditional to pour brandy on the top of the pudding, light it, and bring it to the table with a flame. It produces a subtle, but pretty blue color. There is so much history in this little dish. 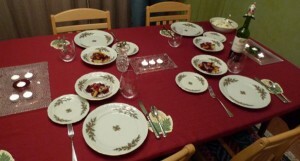 I found it fascinating to take part in a tradition my great-grandparents and their parents probably also took part in. I based my puddings on a recipe from the BBC. I halved the recipe, and made individual puddings in 6 small 8-ounce ramekins. I replaced the Bramley apple with a Granny Smith, since Bramleys are not readily available to us in the States. I only used 4 ounces of butter for half of the recipe, since American butter is packaged in 4-ounce (or 113 gram) sticks. It was a little less than half of what the recipe called for, but it was plenty. I only needed to steam the puddings for 3 hours instead of 8 since I made them in the small ramekins rather than larger bowls. I also used a simple glaze of powdered sugar and cognac instead of the buttered version. Get everything prepared. Chop the almonds coarsely. Peel, core and chop the apple. Sharpen your knife and chop the candied peel. (You can chop the almonds and apple in a food processor, but the peel must be done by hand.) Grate a little over 1/4 of the nutmeg. Mix all the ingredients for the pudding, except the butter, in a large bowl. Holding the butter in its wrapper, grate a quarter of it into the bowl, and then stir everything together. Repeat until all the butter is grated, then stir for 3-4 minutes – the mixture is ready when it subsides slightly after each stir. 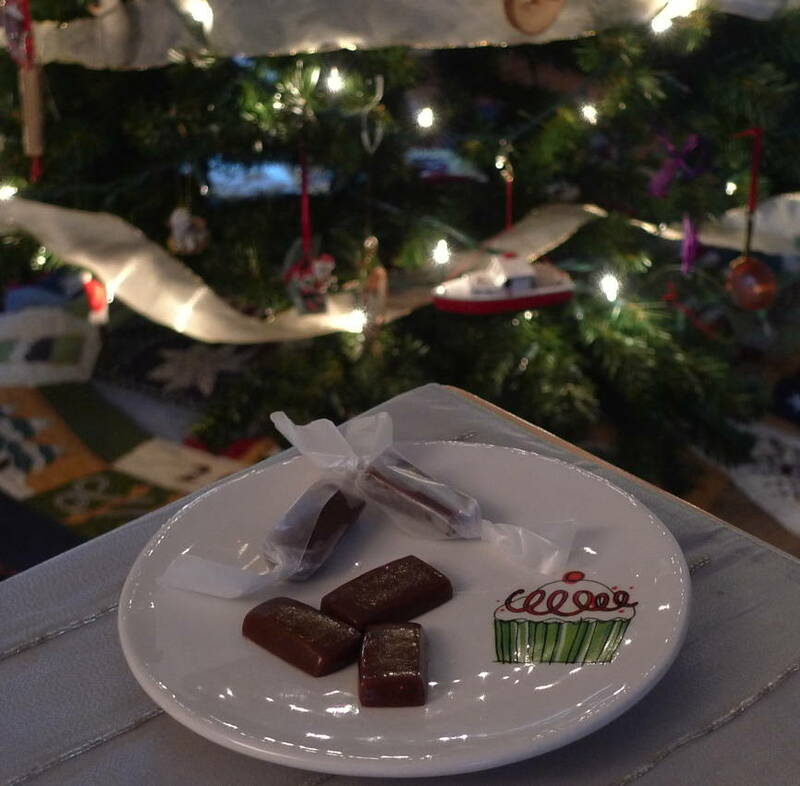 Ask the family to stir too, and get everyone to make a wish. Generously butter six 226 g (8 ounce) ramekins and put a disc of greaseproof paper in the bottom of each. Pack in the pudding mixture. Cover with a double layer of greaseproof paper or baking parchment, pleating it to allow for expansion, then tie with string (keep the paper in place with a rubber band while tying). Trim off any excess paper. Now stand each bowl on a large sheet of foil and bring the edges up over the top, then put another sheet of foil over the top and bring it down underneath to make a double package (this makes the puddings watertight). Tie with more string, and make a handle for easy lifting in and out of the pan. Steam the puddings for 3 hours, topping up with water as necessary. (I used a big pot with a steamer basket on the stovetop, taking care to keep the puddings above the water.) Remove from the pan and leave to cool overnight. When cold, discard the messy wrappings and re-wrap in spanking new greaseproof or baking parchment, foil and string. Store in a cool, dry place until Christmas. 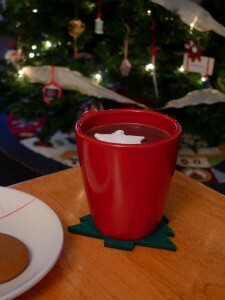 On Christmas Day, steam until warmed through. (Microwaving also works in a pinch.) Unwrap and turn out. 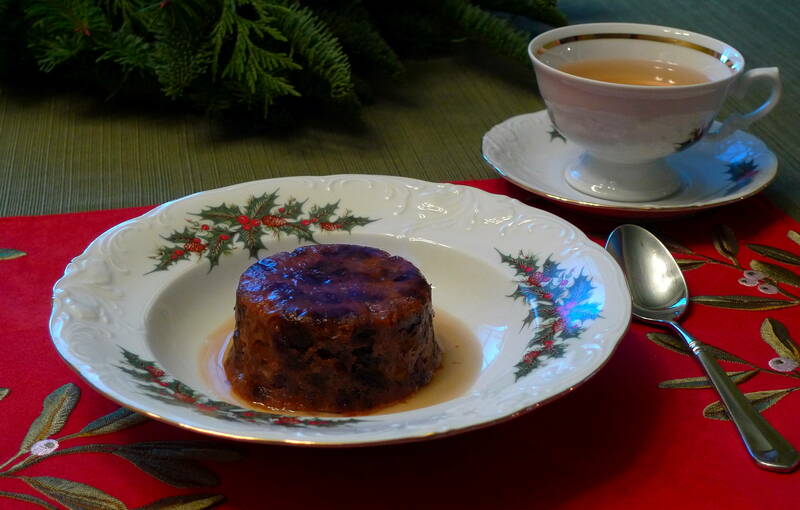 To flame, warm 3-4 tbsp brandy in a small pan, pour it over the pudding and set light to it. 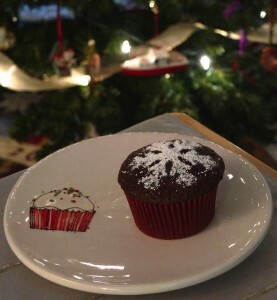 Top with a glaze of brandy or cognac and powdered sugar. Add a little brandy at a time to the sugar until the glaze is to the consistency you like. Pour the glaze over the puddings before serving. PS. The top photo has a faint blue cognac flame on my Christmas pudding. 🙂 Click on the picture for a closer view. The recipe for the marshmallows can be found here. Santa needs to have some cookies on Christmas Eve, so I baked up a batch of my favorite pine nut biscotti for him ;). This recipe makes me think of Christmas since the creamy nuts are another part of the Christmas tree! I think it’s a fun but sophisticated version of a Christmas cookie. 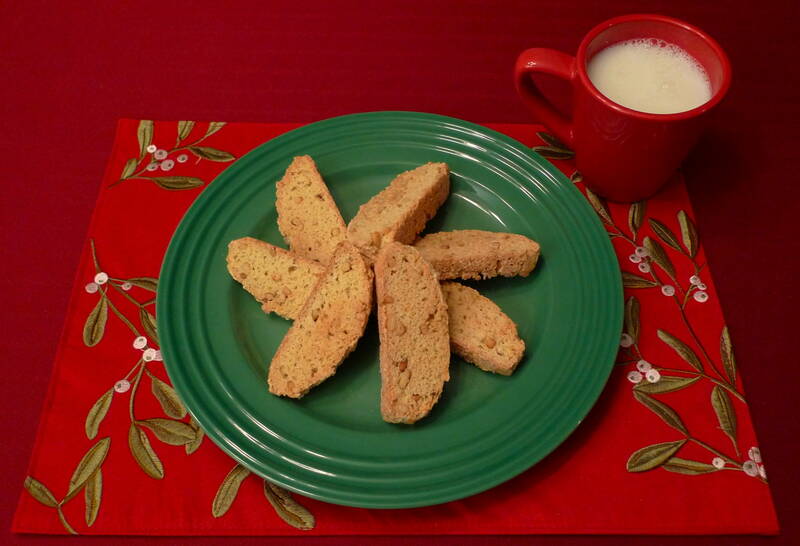 I’ve made these cookies for several years now, and they’ve become a favorite at our house. They also ship well if you’d like to send them to loved ones far away. 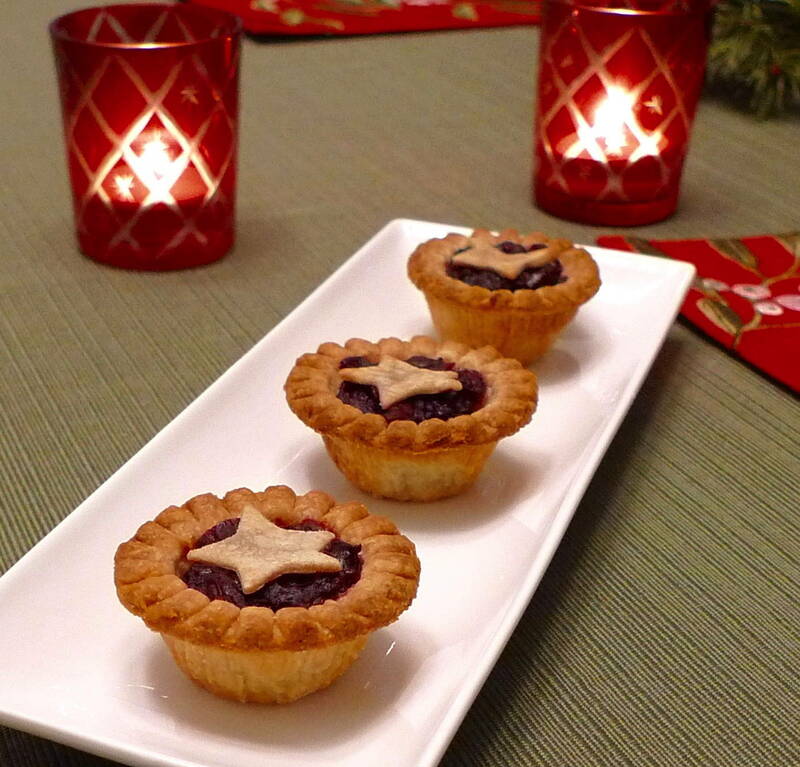 They are naturally low in fat since there is no added oil or butter, so they are a good choice in lieu of some of the decadent Christmas goodies of the season. I hope you enjoy them as much as we do! 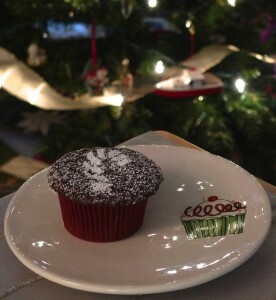 And don’t forget to save a few for Santa ;). Lightly spoon flour into dry measuring cups; level with a knife. Combine flour, sugar, baking powder, salt, and baking soda in a large bowl, stirring with a whisk. Stir in pine nuts. Combine 1/4 cup plus 2 tablespoons water, rind, vanilla, and eggs, stirring with a whisk. Add egg mixture to flour mixture, stirring until well blended (dough will be dry and crumbly). Knead dough lightly in bowl 7 or 8 times or until a dough forms (dough will be sticky). Divide dough in half. Shape each portion into an 8-inch-long roll. Place rolls 6 inches apart on a baking sheet lined with parchment paper; flatten each roll to 1-inch thickness. Bake at 325° for 30 minutes. Remove rolls from baking sheet (do not turn oven off); cool 10 minutes on a wire rack. Cut each roll diagonally into 15 (1/2-inch-thick) slices using a serrated knife. Place slices, cut sides down, on baking sheet. Bake at 325° for 15 minutes. Turn cookies over, and bake an additional 10 minutes (cookies will be slightly soft in center but will harden as they cool). Remove from baking sheet; cool completely on wire racks. Amid several heavy Christmas dishes, I made a light and festive salad that was inspired by a recipe from Domaine Chandon. The different elements really came together to make a delicious combination. It was very easy to assemble, but it felt a little special. 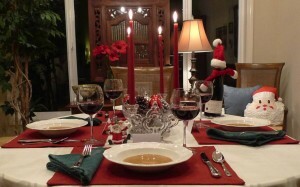 That’s my idea of the perfect Christmas dish :). I used walnuts instead of pecans to go with the walnut vinaigrette. I also replaced the butter in the nut recipe with Earth Balance, one of my exciting new culinary discoveries of the year :). In a small saucepan, melt the Earth Balance over low heat. Stir in the maple syrup, brown sugar, cinnamon, cayenne, and salt. Add the walnuts, stirring to coat well. Spread the walnuts on a baking sheet and bake until toasty brown, about 15 minutes, stirring every 5 minutes to prevent sticking or burning. Remove from the oven and let cool. Store in an airtight container at room temperature for up to 1 week. In a large salad bowl, combine the walnut oil, olive oil, vinegar, mustard, shallot, and garlic. Whisk until the vinaigrette thickens and all the ingredients are thoroughly blended. Add the endives, frisée, fennel, and pear to the bowl. Toss gently until evenly coated with the vinaigrette. If desired, season with salt and pepper to taste. 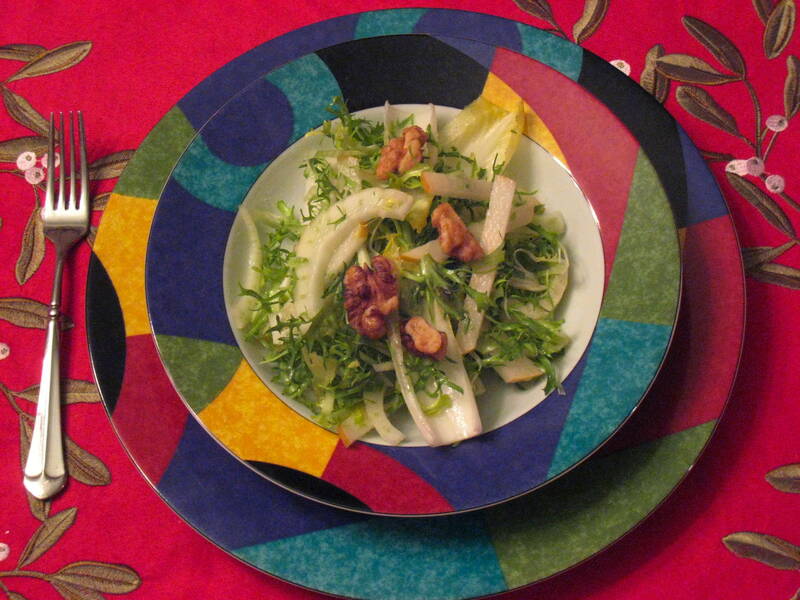 Divide among 4 salad plates and garnish with the walnuts. Serve at once. 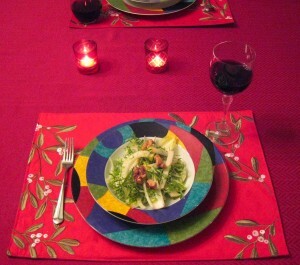 One of our favorite salads for Christmas is called a Three Kings Salad. 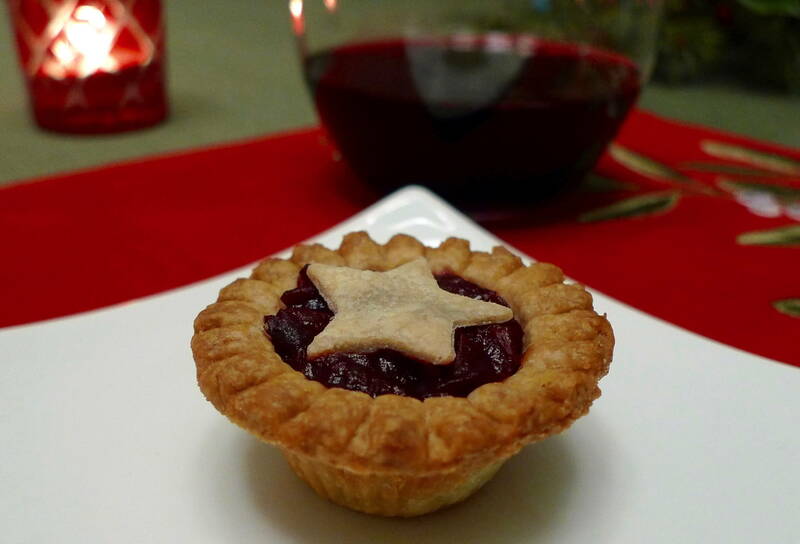 It fuses a colorful group of three of the season’s best and tastiest :). I was inspired by the original recipe, which can be found at MyRecipes.com, but I added and omitted ingredients to our taste. It is forgiving, so use whatever you like. If you like less orange or more onion, that’s fine. Make it yours :). Honestly, we kind of changed one of the “kings” from red onion to pomegranate seeds. I only used a tiny bit of onion for garnish, since neither Rob nor I are big raw onion fans, and I used a ton of pomegranate seeds since we love them! 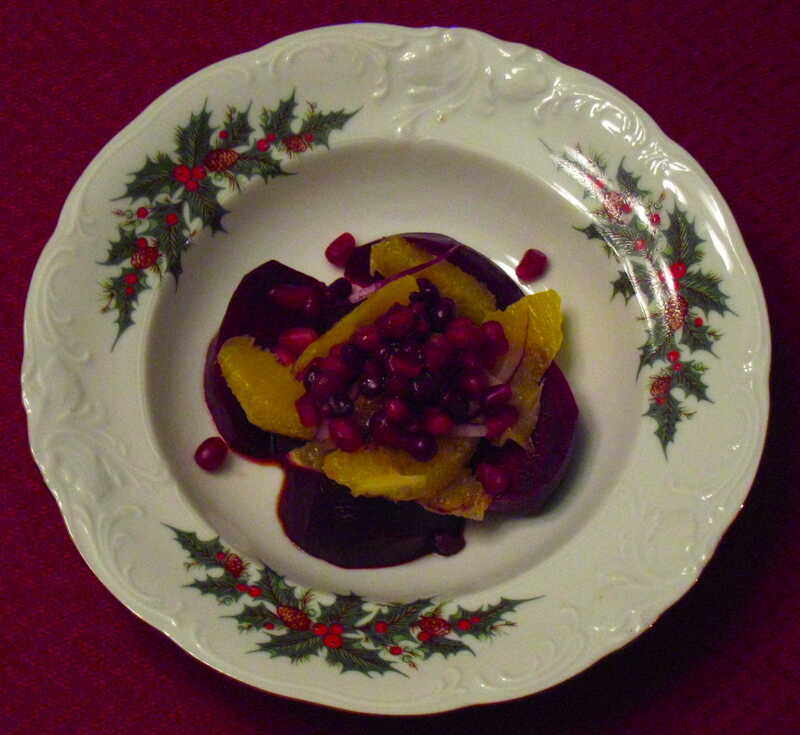 Is there anything more festive than roasted beets and pomegranate seeds? I don’t know what it is about those two, but it just feels like a holiday to me! Both take a wee bit of work to prepare, so they feel like food for a special occasion. Preheat your oven to 375. Trim the beets of their greens, drizzle with a little olive oil and wrap tightly in tin foil. Roast for 45 to 55 minutes (depending on the size of your beets) or until they can be pierced with a fork. Let them cool. Preferably with some sort of thin disposable gloves so you don’t dye your fingers, peel the outside and cut into wedges. Peel and section oranges over a bowl with a knife so none of the pith or membrane remains. Squeeze the extra juice into the bowl when finished. Set the orange sections aside and reserve about 2 tablespoons of the juice. Combine the reserved 2 tablespoons of orange juice, vinegar, oil, salt, and pepper in a medium bowl and whisk well. Divide the beets, oranges, pomegranate seeds and onion evenly among 4-6 salad plates, depending on the size salad you would like to serve. Drizzle with as much of the vinaigrette as you like. I hope you all have a very merry Christmas! 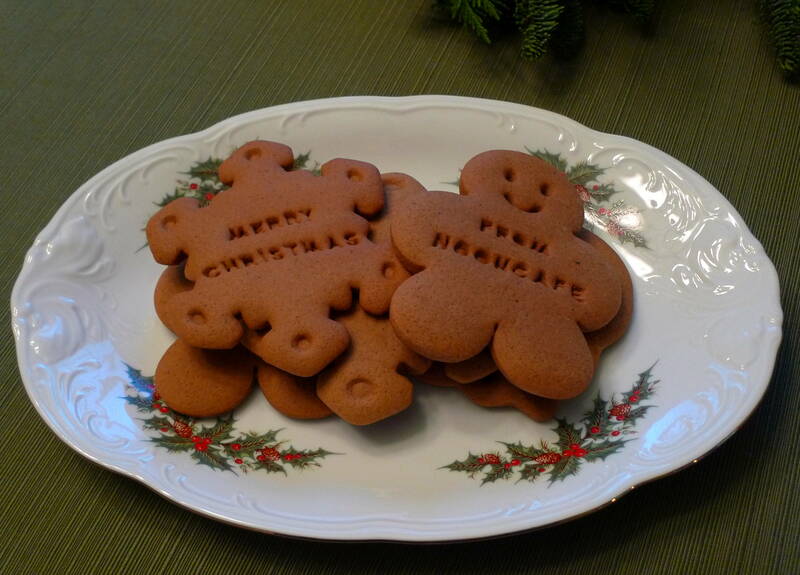 Today was Christmas cookie day at our house :). I spent a fun afternoon baking a couple of batches. 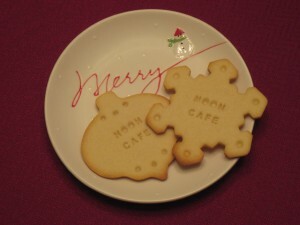 I found the cutest little cookie cutters at Williams-Sonoma this year that made them extra special. They are shaped like a gingerbread man, a snowflake and a Christmas ornament, but the cool thing about them is that you can add personalized messages that press into the cookie dough design. I made some of our cookies with special inscriptions like the names of our nephews, Miro, Ivan and Zach and this website name. I used a classic sugar cookie recipe from Cooking Light magazine that can be found at MyRecipes.com. It is a lightened version of the classic, so I followed it pretty closely. It uses less butter than most recipes as well as only egg whites with no yolks, but it has a great trick for rolling so you can get away with less fat without cracking the dough. This recipe doubles nicely if you desire. 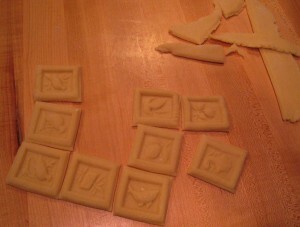 They are also good with a little icing, though I opted for plain cookies this time around to show off the cute design. Combine the flour, baking powder and salt with a whisk in a medium bowl. Place the sugar and butter in a large bowl and beat with a mixer until fluffy. Next, beat in the vanilla and egg whites. Gradually add the flour mixture to butter mixture and beat at low speed until just combined. Divide the dough in half. Shape each half into a puck, about 4 inches across. Wrap each puck in plastic wrap and chill 1 hour. Unwrap 1 dough puck at a time. Smooth the plastic wrap on your work surface, and put the dough in the middle. Add another sheet of plastic wrap on top, so the dough is surrounded on both sides. Roll the dough in between the plastic until it is about ¼ inch thick. (The plastic allows the dough to stay in one nice piece without more fat.) Chill the dough another 30 minutes. Remove one portion of dough from the refrigerator at a time. Remove the top sheet of plastic wrap and replace it with a sheet of parchment paper. Run the rolling pin over the parchment a couple of times to smooth the top of the dough. 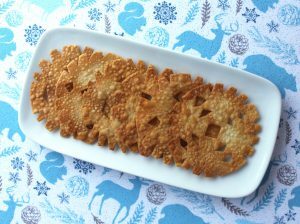 Remove the parchment, and using a cookie cutter, cut your dough into the shapes you desire. 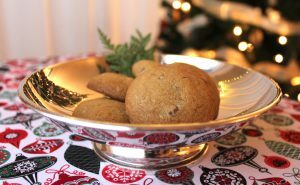 Place the cookies about 2 inches apart on the baking sheets lined with parchment paper. Bake at 375 for about 10 minutes or until lightly browned. Cool on the pans for 5 minutes. Then transfer to a wire rack to cool completely. Repeat with the remaining dough. Beat the eggs until light with an electric mixer on high speed in a large bowl. Reduce the speed and add the anise and sifted sugar. Beat until well combined. Sift the flour and baking powder and stir them into the egg mixture. The dough will be rather stiff. Roll the dough to about 3/8 inch thickness. Imprint the dough onto the springerle board and cut apart with a pizza cutter. Place the cookies on a baking sheet (this recipe will make about 2 sheets worth of cookies), and let them dry uncovered overnight. This will allow the designs to stay crisp when they are baked. In the morning, preheat your oven to 350. 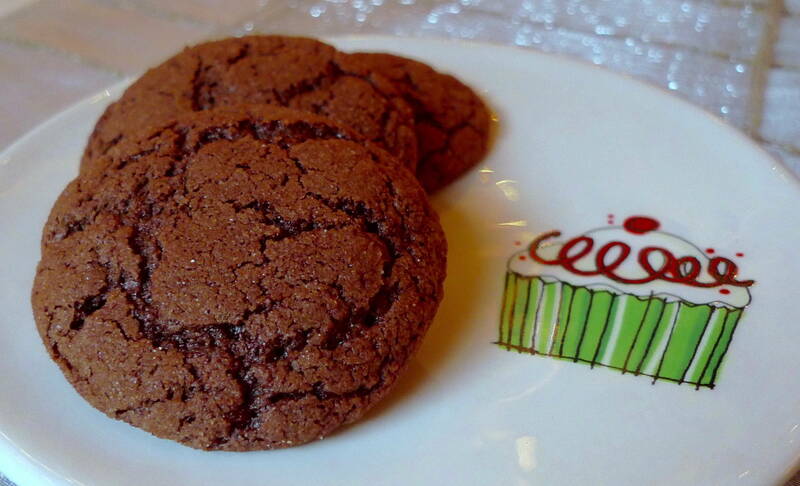 Bake the cookies for about 8-10 minutes, until cooked through but not golden.